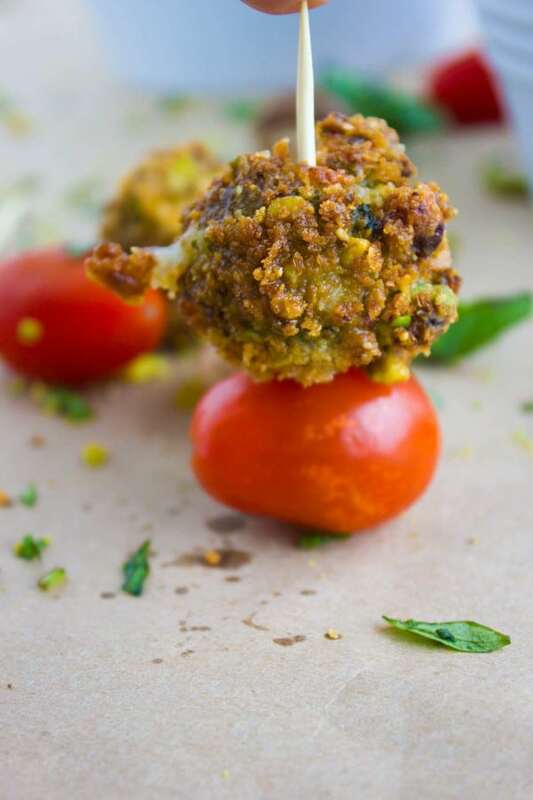 This pistachio fried Caprese Bites recipe is a nutty fried version of the classic Caprese salad. 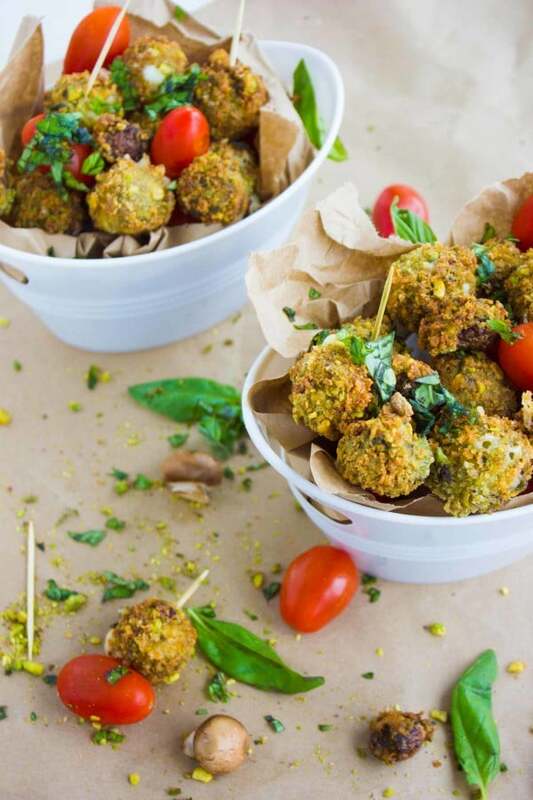 Frozen bocconcini mozzarella is rolled in a basil pesto and balsamic mixture, then coated in a pistachio panko breadcrumb (gluten free or not) mixture and fried for just 1 minute. The result is a crunchy, pistachio-basil-balsamic flavor loaded bocconcini which pairs with tomatoes and extra basil—absolutely no dressing needed! Every end of the year I get to reflect back a bit on what has passed and what I look forward to, however I think this year I won’t do that. After many years, the thing I probably learned was to just let things be lol. 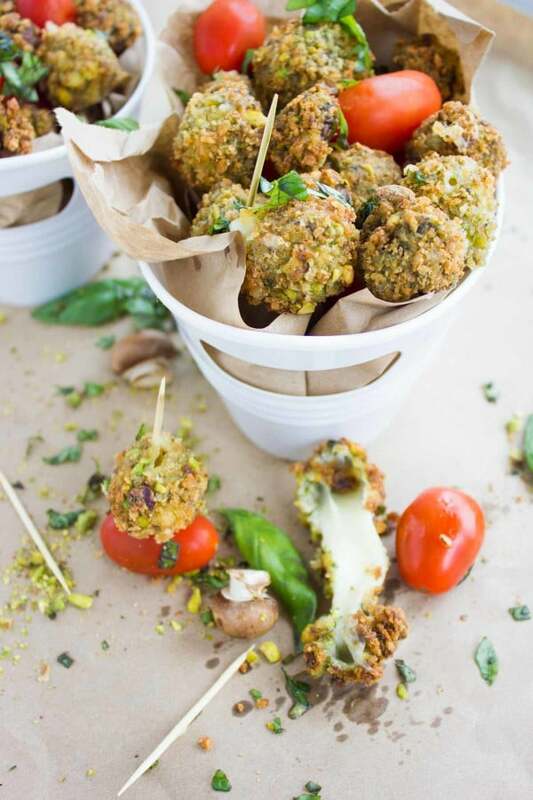 So YES, bring on the fried Caprese bites and let’s have a toast! It’s seriously too good to miss out!! Ok that’s really a reason. Seriously. First of all, this lovely recipe is indeed, fried. I’m usually not a fryer person, well except for those awesome spicy fried chicken fingers with garlic blue cheese dip. So that was chicken and probably I got away with it, but this is a salad—yes I know a salad..
Usually the classic fried mozzarella fingers don’t do much for me, I instantly feel heavy. 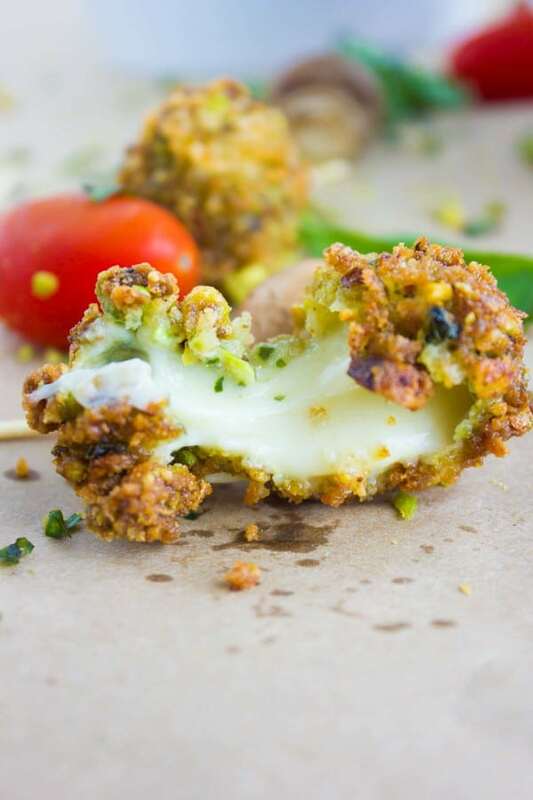 There’s something not heavy about these fried Caprese bites and I can almost say it’s from the pistachio. The pistachio coating gives so much crunch, so much flavor and it feels light as air. It’s certainly takes those Caprese bites to another level! I add a bit of panko bread crumbs to add some body to the coating. Before frying, I coat the bocconcini in basil pesto. Store bought or homemade, like this Protein-Packed Nut Free Hemp Basil Pesto. While this is optional, the pesto adds so much flavor to the fried cheese! I mix an egg and a tablespoon of balsamic vinegar to make the mixture sticky. Start by freezing the bocconcini cheese until frozen hard. This step is super important. Prepare three plates, have some flour in one, a mixture of panko and pistachio in another and finally a basil pesto in the third. Start by rolling the cheese in flour, then in to the basil pesto and finally into the pistachio mixture. Fry the bocconcini cheese until golden and remove from the oil on a paper towel to drain. I repeated the same process with some baby mushrooms, and it’s rather optional but SO good! Fried mushrooms, are like a treat for me! Instead of making Caprese salad, and since I fried the cheese, I love serving them on a stick with some tomatoes, fresh basil leaves. It feel like a Caprese salad, only a touch crunchier! The basic tip here is to freeze the bocconcini really well before attempting to fry them. And I mean really well. You got to remember the bocconcini has much much more moisture than regular mozzarella and if not well frozen—that’s a frying disaster right there! The egg added to the basil pesto helps the mixture stick really well to the frozen cheese, so don’t skimp on that. Any type of pesto would work awesome here—maybe this sun dried tomato pesto? Even though I didn’t want any dressing—to me it felt like good street food—feel free to try a basil vinaigrette (a perfect one here in this blackberry pecan roast veggie power salad), balsamic reduction (hello rainbow power grilled haloumi salad) or your favorite! Also, let me tell you, do you remember this AMAZINGLY refreshingly sweet take on caprese: strawberry caprese salad ?Super light, sweet, healthy and super good—a must try if you’re having gorgeously warm weather now, or when Spring hits back next year! 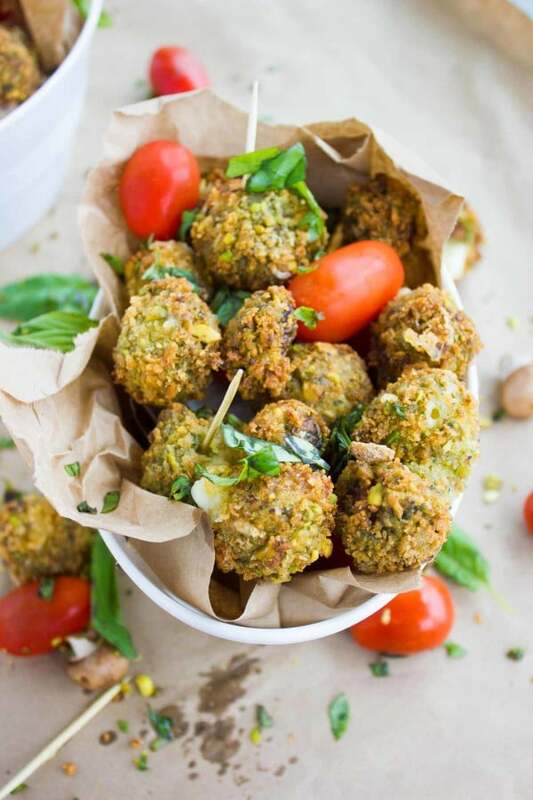 So I’m not all that bad influence you see..but for now I urge you to make yourself a nice plate of these pistachio fried caprese bites and share it with a nice bunch of people. Place the bocconcini on a parchment or wax paper lined tray and cover it with plastic wrap. Then freeze it over night r at least 6 hours until the cheese hardens completely. In a bowl add the flour. In a separate bowl, add the pesto, balsamic vinegar, egg and a pinch of salt. In a third bowl, mix the pistachios and panko bread crumbs. 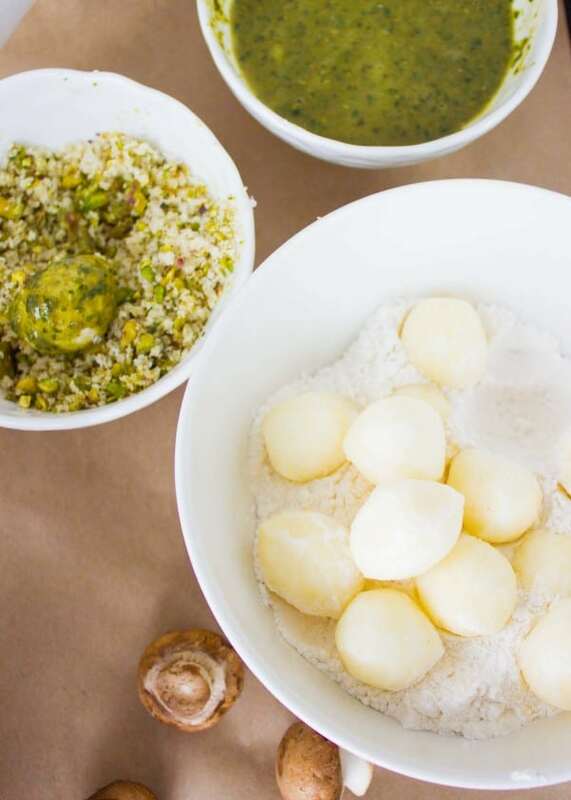 Preheat an electric fryer or a small pot filled half way with oil till 375 degrees F.
Take each bocconcini ball and dredge it in the flour bowl, shake off any excess. 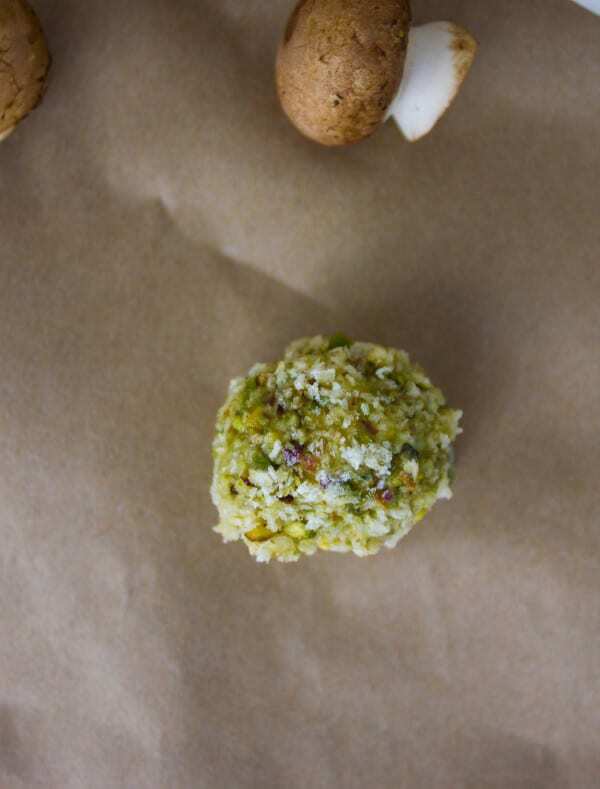 Then drop it in the basil pesto mixture and roll it well to coat, and finally roll it in the pistachio bowl and make sure the entire surface is covered well with the coating. Place on a wax paper lined plate. Repeat with all the bocconcini, and if you’d like to fry mushrooms, repeat the same procedure with the mushrooms too. Fry the bocconcini and mushrooms for just 1 minute and maybe 30 seconds extra (depending on the temperature of your oil and how crowded your pot is). Drain on paper towels and sprinkle a pinch of salt. Serve. The egg added to the basil pesto helps the mixture stick really well to the frozen cheese, so don't skimp on that. Can you just pass me a plate full through the screen! These look so very delicious. I wish I could Tina 😉 Thanks! I love the idea of using healthful pistachios. The cheese paired with the tomato…So smart. Perfect for the big game…or anytime really. On my “to try” list. Gorgeous photos too. 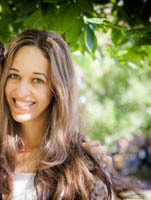 Thanks Lydia–you will love those! These look dangerously delicious! Pure decadence in bite-sized form. Thanks for sharing the recipe! I have a whole bunch of pistachios lying around my house. I would love to use them on this!! You’ll love this one Cathleen! 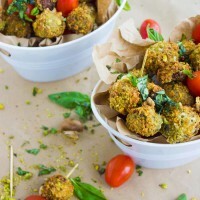 Wow pistachios are my favorite nut and these fried bites sound like an addicting appetizer to me! Hope you make it Claudia! I’m not sure where to begin! 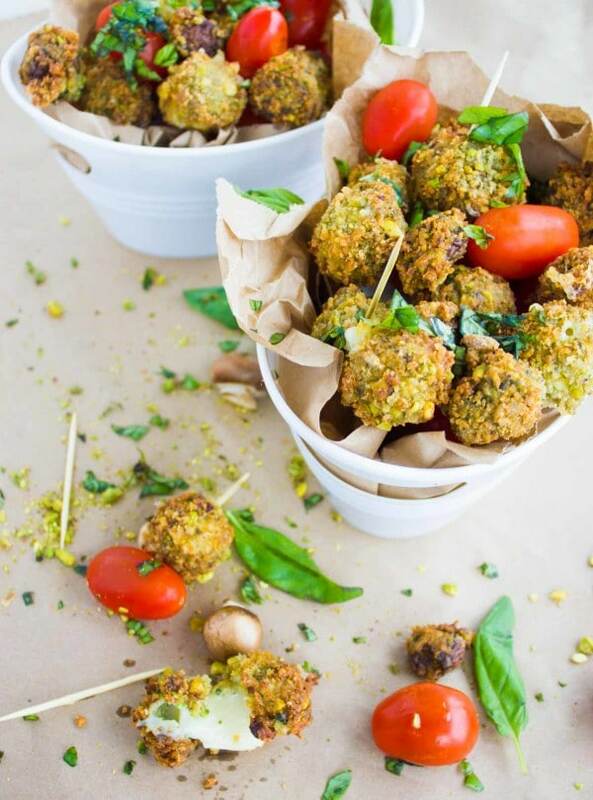 I love everything about these delicious Caprese bites! I love cheese and these are cheesy delicious! Then there is pesto and pistachio! These are my kind of treats! Hope you make it Eileen!! This is a 100% perfect recipe for me and my family. A wonderful and light snack. Of course I want to try it. Looks very appetizing. What a fun idea! I love caprese but have never thought to include pistachios! I’m going to have to try this! You’ll love this one Lauren! Oh my, I have not eaten fried mozzarella in ages and this is really making me wanna go make some. I think my kids would love this. Love the addition of pistachio nuts. You need to make this one Veena!! What adorable appetizers and they have my favorite ingredients. I’m nuts about pistachios along with cheese. Yum I can imagine them warm and gooey. They wouldn’t last long at our house. Need to test it out 🙂 No reason why it shouldn’t work!